Well, anyone that looks at our web page regularly will realize that we have been having it upgraded. I’m sorry if anyone has struggled to find what they want – it will all be sorted out in time. 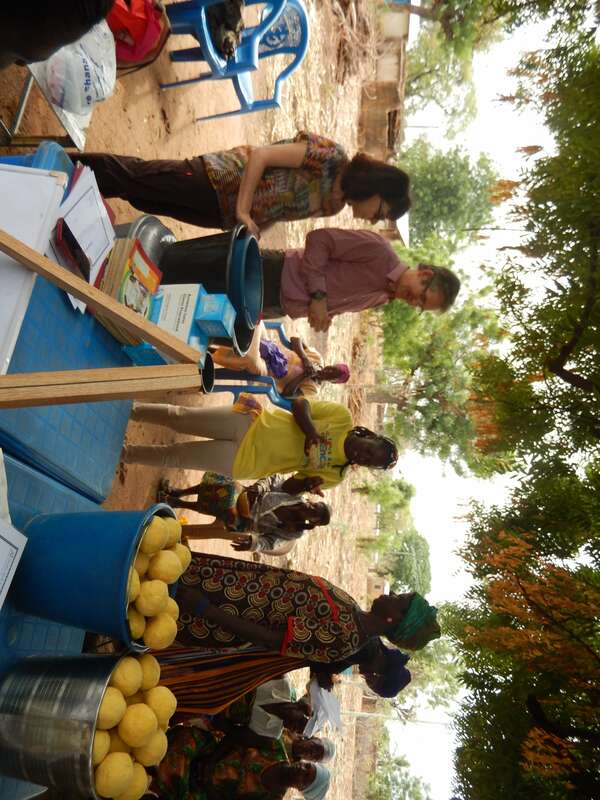 We spent two weeks in Ghana at the beginning of February and had a very successful visit. We visited several mango plantations where the trees were at last looking like trees and some even had fruit on them. We also met some women who had done a literacy and soap making project. These women were all widows, struggling to bring up their families without the support of a husband. They farm in the wet season but need work in the dry season. They have never had the opportunity to learn to read or write and were poor at numeracy. By teaching them basic skills in literacy and numeracy and then soap making they are now making an earning making and selling soap. They now can work out how much raw materials to buy and how many pieces of soap to make so that they are making a profit. Our partners in Ghana will keep visiting them to check they are succeeding. The soap they make are large round balls – you can see them in the picture below. Next month I’ll tell you about the wonderful dry season farming project we visited. Happy New Year everyone and I do hope you had a wonderful Christmas. Alistair and I are travelling to Ghana at the end of this week. We will be visiting the fruit tree projects in the Upper East region as well as the seed bank projects in Upper West. One of the communities that are part of the seed bank project is a christian community that we visited last year, who were struggling with lack of water. A local charity, Ghana Outlook, has (or is going to) sort out the borehole and we will be able to see this in action. We will also visit Nyoli Koraa, a community that Jacob’s Well Appeal were able to dig a borehole for just before Christmas. We are so grateful for all the support we receive that enables us to do such wonderful things. When the borehole is dug the community is also given training on how to look after it and as well as classes on hygiene and water usage. We will also visit King’s Village where the medical boat is situated to see how things are progressing there. Whilst in the Upper East Region we will also visit our Dry Season Farming Project. As I have mentioned before, farming in Sub-Saharan Africa tends to occur with the rainy season. The farmers plough the land and sow the seed when it starts to rain and then harvest when the crop has grown. Because of lack of water they do not farm outside of the rainy season. As most men are farmers, they have little to do the rest of the year and just before the harvest their families are hungry, if not starving. People in this area have avoided living near rivers because of the risk of River Blindness, spread by the black fly. Now we can prevent this disease causing blindness, people can live nearer water and this opens up the ability to grow crops all year round with irrigation. The farmers need training on how to do this and this is what our Dry Season Farming Project is all about. They also get training in managing their finances and are encouraged to send their children to school. York Viking Rotary Club has funded this project and we are very excited to go and see how it is getting along. 15 men and 15 women are taking part from the Gogoringsa Community which is near a reservoir so they have a ready access to water to irrigate their land (see below). Jacob’s Well Appeal raises funds by fundraising, including our book sales, and generous donations given by our supporters. We also have two charity shops – one in Beverley and one in Bridlington, as well as two franchise shops. These franchise shops are run by the Gateway Church in Withernsea and Filey, and Jacob’s Well Appeal provides merchandise which they sell and give us a share of the profits. Our two ‘charity plus shops’ are christian bookshops, selling new christian literature, gifts and cards. They also sell second hand clothing, bric-a-brac and books and both have a cafe where you can go for a drink, a piece of cake and a chat. Our managers are happy to talk through any issues you may have and offer prayer if you would like it. If you’ve not visited us recently, please pop in for a look around. Our Bridlington shop is on the promenade next to the new Leisure World. Our manager at the Beverley shop is moving to Hastings to be with her family and we pray that she will be happy with her new situation. Many customers and volunteers will miss Sue – thank you for all your hard work. Our Beverley shop is on Ladygate, very close to St Mary’s Church. We have two new managers, Sally and Ian, starting in Beverley who are going to ‘job share’. They have spent their first week shadowing Sue and next week will be setting out on their own. I am sure Sally and Ian will put their own stamp on the shop and if you are passing please pop in and greet them – they’ll be happy to make you a cup of tea! April passed in a blur with wedding plans etc. It seems like ages when we were in Wa in Ghana. We travelled to Wa from Accra via the overnight public bus. They travel in convoys of three with armed guards on the first bus, mainly because of the risk of bandits on the open roads. As you travel into the north of the country there are no lights on the road and only speed bumps warn you of the small communities you are passing through. They play very loud videos (not in English) on the bus and keep the air con very cold all through the night so by the time you arrive you are definitely shaken and stirred! I won’t mention the toilet stops…….. The goats going into the boot (!) of the bus for the 12 hour journey to Wa – they did survive. Wa is like a different world to Accra, the northern part of Ghana being much poorer and less developed than Accra, as well as more rural. 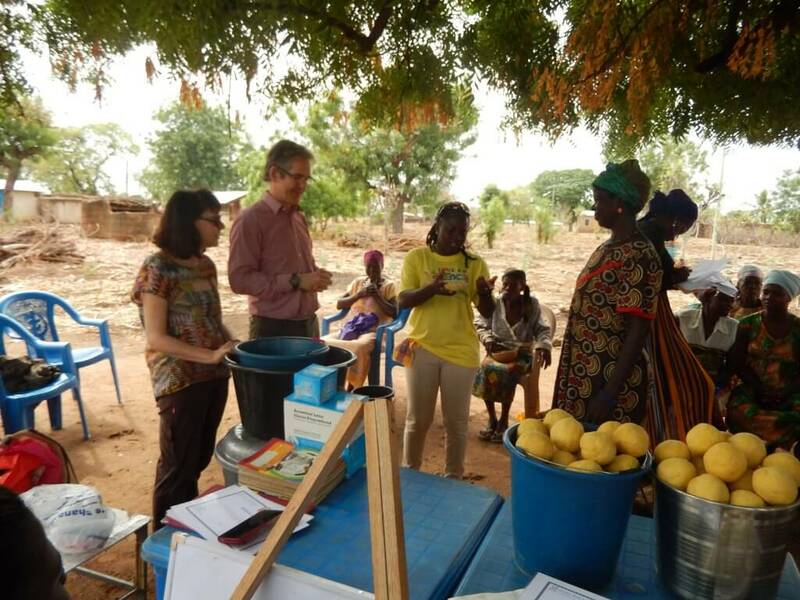 We met with our partners, C4C who run our seedbank and fruit tree projects in the Upper West and Upper East regions of Ghana. A lady selling food just outside where we were staying. We visited one community that are doing the Seedbank project in a very rural area outside of Wa. The poorer women of the community are given 6 large bowls of soya beans to plant one acre of land, and then they return that amount at harvest (in order the maintain the Seedbank), keeping the remaining 30 bowls for themselves. The land is ploughed by a tractor that was generously donated by a local East Riding farmer which was sent by JWA several years ago. This community is a christian community that were struggling because their only water supply, which was from a bore hole, was running low. Instead of a stream of water there was only a trickle and so it was taking much longer to fill their containers. We were concerned that they would not survive until the rainy season. Even the river nearby was completely dry. We prayed with this community and Alistair prayed for rain – although no one there had ever seen rain in Northern Ghana in February /March during the dry season. Alistair talking to the women of the community. By the time we were leaving the community it had become very windy and there were a few spots of rain. By the time we reached Wa it was starting to rain – it rained heavily for 12 hours and flooded the area. Even in the rainy season it only rains for a few hours a day. Everyone was amazed – what an answer to prayer! We are hoping to find a donor / raise the money to build a bore hole for this community so that they will be water secure for the future. One 3 year old girl in the community had an infected burn caused by hot porridge and was unwell with a temperature. They did not have transport or money to take her to the nearest medical centre. We took her ourselves and bought the medication she required. Even the medical centre did not have any dressings! She also had malaria which could have killed her if left untreated as it is a leading cause of death in children under 5. 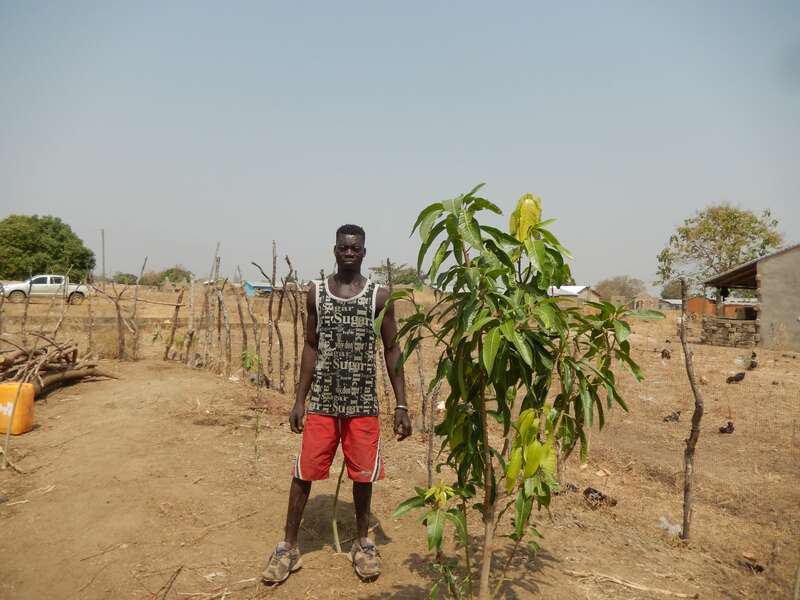 We also visited the Eastern Region of Ghana where JWA with C4C’s help have planted several fruit tree orchards. One headteacher in particular had motivated his pupils to look after their trees and was so grateful for the support of our donors to enable them to have mangoes in the next few years. How the time flies! Alistair and I went to Ghana in February, returning at the beginning of this month to find that our daughter was going to get married at the end of April – we did have a sneaky idea that this was the plan – which is my only excuse for not writing sooner. Ghana in February is hot and dry, as it is their dry season. Our primary purpose for the visit was to meet with the ministry of health to discuss (and hopefully sign) a Memorandum of Understanding. This would enable us to send in the medical aid tax free. Without this the Ghanaian government require that we pay the tax up front and we may or may not get a reimbursement. This has meant that we have been unable to send any medical aid to Ghana in the last 12 months. We were very fortunate to meet with the Minister of Health himself during the second week of our stay and on the final day, after a lot of waiting and praying, at 4:30pm (we were heading for the airport at 8pm) we received the signed official copy – Praise God! We spent the 1st week visiting the King’s Village where the Rotary medical boat had been sent. The King’s Village consists of a school, hospital and nutrition centre. It lies about 6-8 kilometres from the river Volta and receives very poorly patients from the isolated communities on the other side of the river. The boat had been used for a medical mission by a visiting consultant from the USA, but the King’s Village are struggling with funding to run it regularly. We were able to use it to visit the community on the other side of the Volta. This community is 6 kilometres from the water during the dry season, but much closer when the river floods. There is only a dirt track to the village, which we travelled along on a tricycle or ‘motorking’. The medical centre there was struggling with barely any provisions and the next day we met with the Regional Director of health to discuss whether the Kings Village could run this clinic for the community of 8,000 people. This would mean the boat could be used to deliver midwifes, transport patients to the Kings Village and supply the clinic during the dry and wet season (via boat and motorking). It could also, at the same time, ferry paying passengers to help cover the cost. This community at the moment can either use a wooden canoe or travel 2 days to cross the river to get healthcare or to take their produce to market. They even have to use the canoe to transport the motorking if the patient can’t sit on a motorbike! Whilst we were in Ghana 6 people died using one of these canoes – a common occurrence.During the wet season it is impossible to get across the river on these canoes. This is the medical boat being loaded with the motorking in which four of us sat in the back along a very bumpy road! I will write next month about our visit to Wa, which was to check the seedbank project and fruit tree plantations. We thank everyone for their generous support and their prayers for all our projects and I pray that you all have a wonderful Easter. Alistair and I, along with Bridget our office manager and Chris, one of our medical volunteers, were delighted to attend a function at the Hull Eye Hospital last week. The event, A Sight to Behold, was part of the Hull City of Culture and was the unveiling of a sculpture at the hospital. Part of the sculpture is a collection box for donated old/unused spectacles, aiming to create a legacy from the project. We had been invited to the event because the project will be donating these spectacles to Jacob’s Well Appeal, so that we can distribute them overseas. We were so grateful they had included us in this. These glasses are invaluable to those who can not otherwise afford them, giving them the gift of sight. We have just completed filling our first container to Somaliland. This is the northern region of Somalia which was once a British protectorate. We are working with a charity that was formed by British people with family members living in the region. This is a very poor area of the world with very limited medical facilities. Alistair and I are aware that we may have to visit before sending a further container, which will be quite an experience. We are now looking forward to going to Burkina Faso next month. We are visiting our partners in Ouagadougou to work out how to help them with the hospital they are building and also to try to plan the setting up of an agricultural college. As we know nothing about agriculture we are going with two of our volunteers who were farmers, along with a school nurse and our main fund raiser. We will also be visiting the school we support in Bobo-dioulasso, Burkina’s second largest city, as well as several fruit tree projects. We are also hoping to co-ordinate a seed bank project. Please pray for the teams’ safety and success in our endeavours!